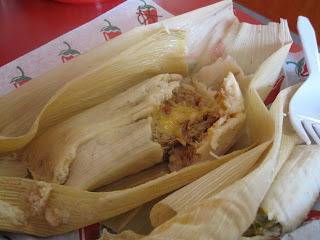 Eats n Feats: Tucson Tamale Co.
You know we LOVE tamales. Really, really, really love tamales. But - well, you know, they use lard in the masa. I've always said that a really good tamale HAS to have lard in it to make the masa light and tender and melt in your mouth good!! Well, not anymore!! Just look at that succulent beauty!! It is melt in your mouth goodness AND it is lard and gluten free. 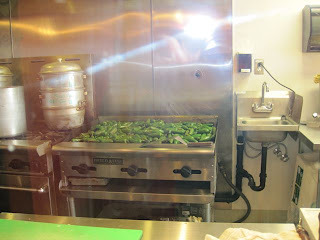 We were in Tucson recently and I had checked out Roadfood.com for a good place to eat and they raved about this place. I'm thinking, "Yeah, right, can't be as good as El Charro!" Always up for a challenge, we decided to try it out. This is a small "mom and pop" business and above you can see their three man production line!! Jalapenos roasting on the grill. These are really good tamales and they do a mail order business. 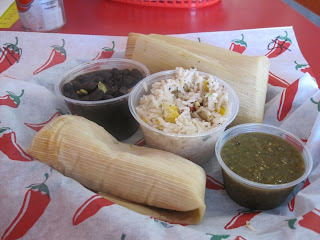 If you have to have a periodic tamale "fix" like we do, order some of these and check out the incredible varieties that they have. 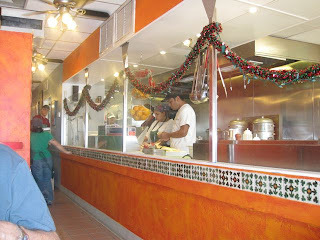 We tried several and the green corn and Sante Fe were the best, but we haven't tried the Thanksgiving one yet. As you can imagine, there are several taking up my precious, limited freezer space! 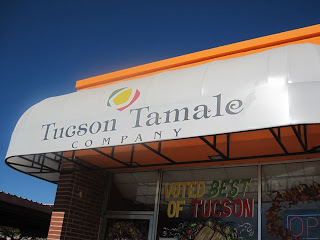 Here's the website: www.tucsontamalecompany.com/menu.html. I'm really close to putting these ahead of the El Charro tamales. Just waiting till we eat the ones in the freezer for the final decision. These are really good especially the part about being lard-free. I see lots of vegetarian options too. I can't wait to go on some foodie adventures when I am there in ONE MONTH! !